A simple promissory note is a brief document written in simpler terms between two people over a loan or transaction. Thinking about bailing out family or friends? With the economy the way it is right now many of us have been asked by family members and friends for loans. When the "I'll pay you back on Friday" does not happen, having a signed loan contract can improve the chances of getting your money back. A promissory letter or IOU is a written promise made by the borrower to the creditor to pay a certain amount of money on a specific date. Below you'll find a Simple Promissory Note sample. It's also a Promise to Pay Letter or Printable IOU. Just copy and paste to your word processor, making the changes and corrections necessary. IMPORTANT: Consult a licensed attorney near you for a more detailed document tailored for your specific needs. It'll have a better chance of holding up in court in case of legal dispute. PRINCIPAL AMOUNT: $ ____________________ DUE DATE: ___________,_____ of 20___. OR its HOLDER to the amount of: ______________________________________ DOLLARS. Interest at the yearly rate of _____% will be added to the unpaid balance. A late charge of $_____________ Dollars will be added to the principal if payment is not made within _____ days of the due date. Witness’ name and address: __________________________________________________. Borrower, promisor, obligor - person who receives the money and must pay back the loan. Lender, promisee, obligee - person who lends the money, receives the payments for the loan. Principal, consideration - amount that is lent by the lender to the borrower, the amount that must be paid, the value of the note. Secured Promissory Note - offers collateral to the lender such as, a house, car, personal property. Unsecured Promissory Note - offers NO collateral to the lender. Collateral - property offered in case payment cannot be made. Due date, maturity date - The day borrower must make payment. Acceleration clause - stipulates that the note’s remaining total becomes due if a payment is missed. Usury laws - dictates the highest amount of interest that may be charged to the borrower, among other regulations. Return from Simple Promissory Note to Home page. 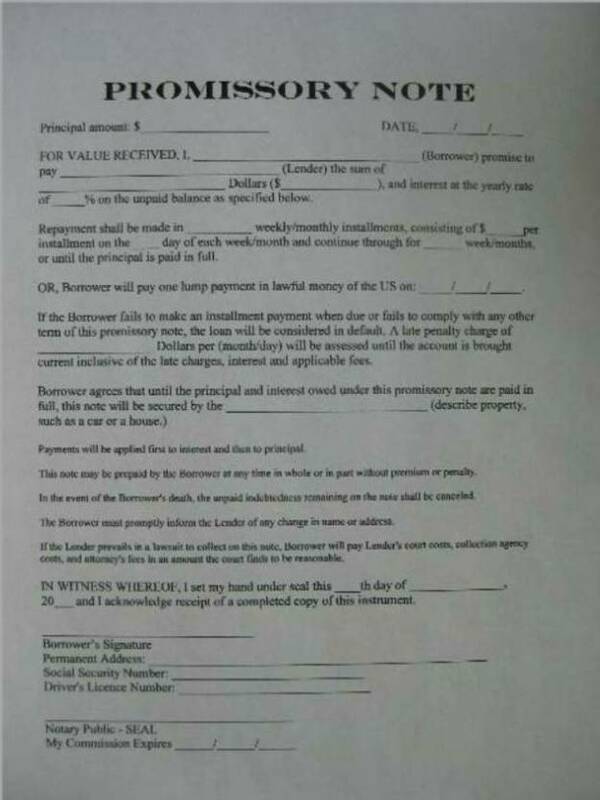 Copyright © 2018 USAttorneyLegalServices.com - Blank Promissory Letter - All Rights Reserved.